Brown Bread - A delicious and healthy bread recipe! 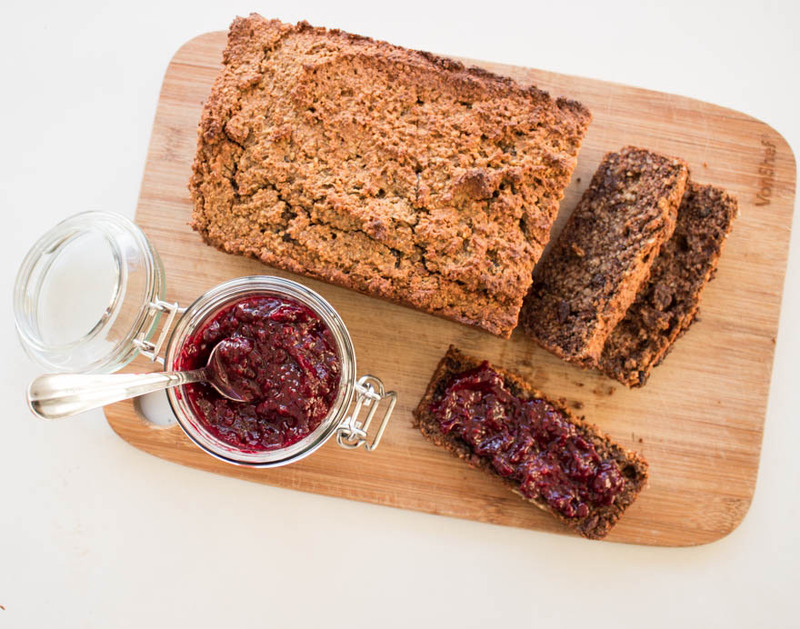 I’m super excited to finally share this Brown Bread recipe. I’ve been working on a delicious SCD bread recipe for so long. Finally, after months of experimenting and tweaking, I’m happy with the result. My measure of success remains always the same method. If my husband would gladly eat this instead of “regular” bread, I know I have succeeded. He’s an honest man and I know I can always trust him for an honest opinion. This blog, for me, has always been about creating delicious recipes. Recipes that anyone would gladly eat – restrictive diet or not. It just happens to be a huge bonus that the ingredients are actually good for us too. After two years on SCD, I had almost given up on recreating bread. Since starting SCD, bread just wasn’t bread. I’ve tried so many recipes and messed around creating my own but I was never quite happy with the final product. I like the other breads I have created on this site but I consider them more of a snack than a bread in the traditional sense. 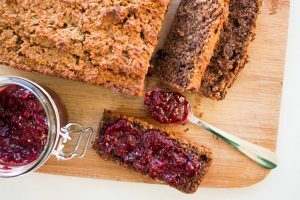 This Brown Bread conjures up memories of bread and jam from my childhood and I am quite proud of that. It is obviously not as solid as regular bread, which is quite the impossible task without gluten or grains. However, it does hold together pretty well. 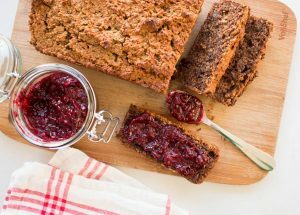 My favourite way to enjoy this Brown Bread is lightly toasted under the grill for a few minutes then slathered with Kerrygold butter and my homemade blackberry jam. For those of you following a gluten and grain-free diet like me, I’m sure you’ve all experienced wanting a break from almond flour. I love almond flour, don’t get me wrong. It can be easy, however, to overdose on it. That’s why I decided to buck the trend with this bread and make it completely without almond flour. The combination of ground pecans and coconut flour really works well here and is not like any SCD bread recipe I’ve tried before. I have found my new bread recipe – that’s for sure. And I’m pretty sure I won’t be straying far from this recipe in the future. When it works, it works, right? If you try this and you like it (or you don’t like it!) please let me know in the comments below. I’d love your feedback! Yes Anette. Walnuts would work perfectly, I imagine. Can I leave out the pecans? You would need to substitute some other nuts e.g. 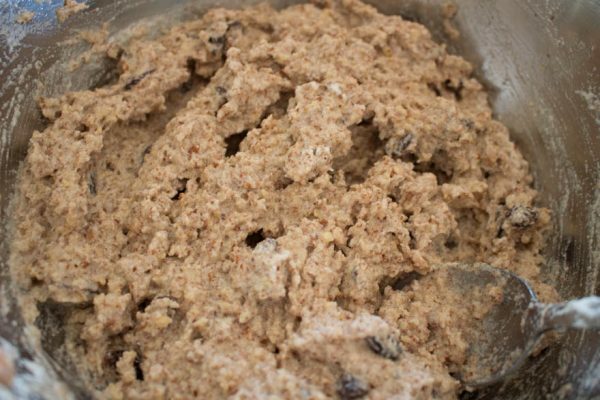 walnuts as pecans make up a large part of this recipe. Let me know if you substitute and how it works out! Is there a substitute for raisins or may I just leave them out? I think they go well in the recipe but you could easily leave them out without substituting them! Can you use whole eggs instead of just whites? Four, maybe? Hi Holly. I don’t think you could use whole eggs instead or at least it would change the whole texture of the bread. I experimented a lot and found that the meringue-like mixture really makes this bread so good. Sorry to disappoint you! Looks amazing. I can’t wait to try it. Do you think it can be frozen? Thanks Rowan. Hope you like it as much as I do! I haven’t tried freezing it yet but I imagine you can! I wanted to know if the recipe calls for “3 cups” pecans before blended or after they are blended. I always question this when I bake with any kind of nuts, thanks. Hi Anne. The recipe calls for 3 cups of whole pecans which you then process to fine pecan flour as per the instructions. Hope this clears it up for you! So glad you like it Anne!! Hi there which blender would you recommend? Thanks! Hi Maria, I am wondering where I went wrong with the recipe. It smells fantastic but the middle section came out wet and gooey. Any suggestions on what to do differently? Thanks! Sorry it didn’t turn out for you. That has never happened to me. Did you mix the batter well enough before baking? I mix everything really well before placing into the loaf tin. Did the egg whites have stiff peaks? Please let me know if you try it again and how it turns out. Fingers crossed the next time is better! Thank you for your reply. I’m wondering if I blended some of the pecan for too long. I will definitely try again!! Yes maybe that was it, Irena. 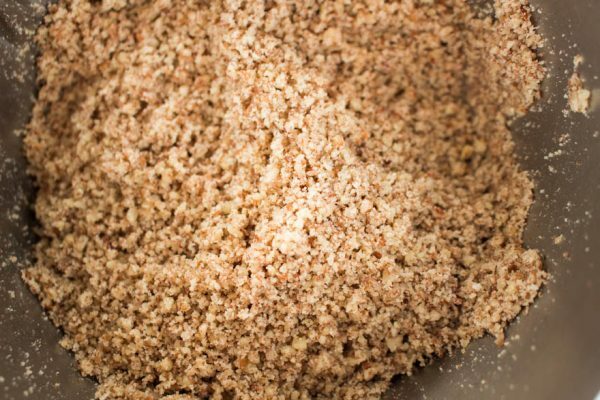 You should blend to pecan flour consistency not pecan butter. Hope you have success the next time! I’ll try this bread during the weekend, love the fact that you don’t use the whole egg as so many SCD bread recipes are way too egg-heavy for my taste. 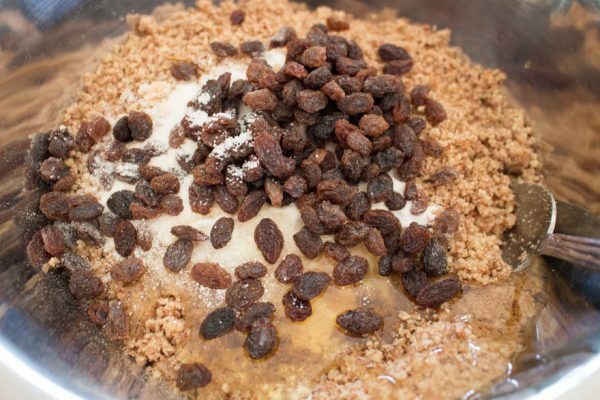 Do you think that adding more ingredients / seeds to the mixture would be an issue? I’d like to add sunflower and pumpkin seeds for more texture. Hi Veronica, Really hope you like the bread as much as I do! I definitely think you could add seeds to the mixture. I love seeds but they don’t love me which is why I don’t include them. Let me know how it turns out for you! GOOD MORNING, COULD i USE ALMOND FLOUR FOR THE RECIPIE?? Hi Julie, I have never tried but I imagine it would change the taste considerably. The recipe is a result of months of tweaking and I really think the ground pecans bring something really special to this recipe. They give it the “brown bread” taste. If you do try it, let me know how it works out!